It’s amazing how something you think is ordinary, like a bicycle, can have the power to change lives. I didn’t realize there were several organizations that recycle bicycles, including Bicycles for Humanity. This book is one of the nominees for this year’s Blue Spruce Award from the Ontario Library Association. In a Tanzanian village school, Anna struggles to keep up. Her walk home takes so long that when she arrives, it is too dark to do her homework. Working through the lunch hour instead, she doesn’t see the truck from the bicycle library pull into the schoolyard. By the time she gets out there, the bikes are all gone. Anna hides her disappointment, happy to help her friends learn to balance and steer. She doesn’t know a compassionate friend will offer her a clever solution—and the chance to raise her own cloud of dust. Brought to life by Brian Deines’ vivid oil paintings, Alma Fullerton’s simple, expressive prose captures the joy of feeling the wind on your face for the first time. 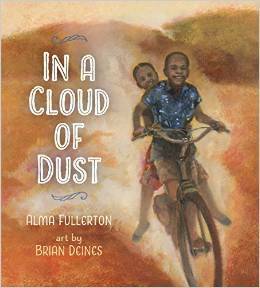 In a Cloud of Dust, written by Alma Fullerton and illustrated by Brian Deines, was published by Pajama Press in 2015. The poetic and lyrical style is lovely. The story is simple, easy for children to understand, and shows so clearly the impact and importance of the bicycles for the village children. It's a good example of a story with an underlying message that doesn't focus on the message, but instead gives us an experience in a child's life. The warm tones of the illustrations suit the mood of the text. I especially liked the way they showed the joy on the children’s faces after they got their bikes. This book is short and provides a good model for a poetic style of language. It could be a springboard for starting a discussion about what happens to things that are thrown away (Earth Day!). It’s also a good starting point for talking about life in other places, though the illustrations show only a tiny bit of life in this village in Tanzania. I wished there were a few more details of the village and what life was like there, so there would be more to discuss with children and to get them thinking and questioning. Research Tanzania to find out more about what it might be like to live there. What other things might Anna do besides go to school? Think about what happens to other things that you or your family might not need anymore. List or make a poster of things that could be recycled. The publisher provides an excellent teacher guide with lesson plans and activities, recommendations for books to pair this one with, and links for learning more. I can picture many African villages I have visited where this story is true. Great Earth Day choice. Sounds like an interesting story! Great teaching ideas.